A plate belonging to the family of Bishop Trelawny, imprisoned in the Tower of London in 1688, has been awarded to the Bishop of Truro. Bishop Bill Ind received the Trelawny Plate at Pelynt Church for his outstanding contribution to the county. The pewter plate, donated by Sir John Trelawny, is awarded to a person who sums up the spirit of Cornwall. 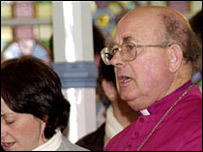 "Bishop Bill", as he likes to be known, said the honour was unexpected, but he was delighted and slightly embarrassed. The bishop is stepping down next Easter, after 11 years in charge of the diocese which covers Cornwall, the Isles of Scilly and two Devon parishes. The original Trelawny plate will be kept in the Royal Cornwall Museum in Truro but a replica was produced by a local firm for Bishop Bill. Sir John described Bishop Bill as a modest man with a warm presence and the ability to make anyone he spoke to feel better. "It says much for this first award that it should be the unanimous opinion of the panel that it should go to Bishop Bill Ind," he said. "Bill has been Bishop of Truro through 10 momentous years. During this time the spirit of Cornwall has been transformed from near universal gloom to one of resurgent optimism." He told the congregation Bishop Trelawny would have approved of his plate being used for "something infinitely more constructive than ornamenting a shelf in my home". Jonathan Trelawny was born in the parish of Pelynt in 1650 and ordained in 1673. He was one of seven bishops charged with high treason and imprisoned in the Tower of London for refusing to implement King James II's Declaration of Indulgence granting religious tolerance to Catholics. Bishop Trelawny was held for three weeks, then tried and acquitted. He died in 1721 and was interred in the family vault at Pelynt Church. The Pelynt Male Voice Choir, known as "Trelawny's Men", led the congregation in Robert Stephen Hawker's The Song of the Western Men - Cornwall's unofficial national anthem and more fondly referred to simply as Trelawny. The song tells of a fictional march by 20,000 Cornishmen to free Bishop Trelawny from the Tower of London.